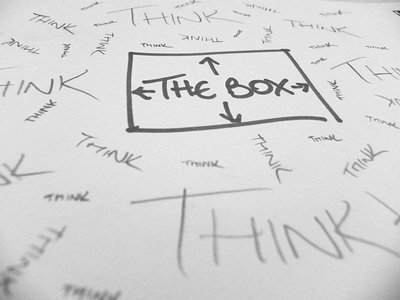 In order to get out of our paradigm paralysis we need to think outside the box but not outside of the Way, the Truth, and the Life. I wrote about paradigm shifting on my previous post so I’ll touch a little on paradigm paralysis. Perhaps the greatest barrier to a paradigm shift, in some cases, is the reality of paradigm paralysis: the inability or refusal to see beyond the current models of thinking (taken from Wikipedia). Being as most people quote Einstein’s I will follow suit, be paralyzed, and keep to that paradigm…I say this in jest. So to be paralyzed in my paradigms is to continue to live based on my current stronghold that has been built since before I was born. Now imagine living before Christ was born in the midst of the Pharisees and Sadducees and Roman occupation. Things have been taught and ingrained into people’s minds for many, many years. Then John the Baptist comes and starts dismantling mindsets to get some out of their paradigm paralysis. And then comes Jesus who is living Truth, the One who has been with the Father, come to shift paradigms and carry on getting others of our paralysis. Lets look at the paradigm paralysis of the Apostle Peter Acts 10. And a voice came to him, “Rise, Peter; kill and eat.” But Peter said, “Not so, Lord! For I have never eaten anything common or unclean.” And a voice spoke to him again the second time, “What God has cleansed you must not call common.” This was done three times. And the object was taken up into heaven again. The Apostles were also stuck in their own paradigm paralysis. They thought, believed, and lived their life based upon what they thought to be true. Or consider pre-Christians and how they lived their lives paralyzed by a wrong paradigm. Or how we currently, even following the Lord, are paralyzed by our wrong paradigms and held captive by demonic strongholds. We have not pulled down these strongholds and have not taken thought captive but we let them build up and create boxed paradigms and are unable to break free. We need that paradigm shift to get us out of paralysis and into the liberty of having our paradigm/strongholds outside of the box and formed by the Holy Spirit and Heaven’s Truth…on earth as it is in heaven. We have the mind of Christ. We think on things that are true, honest, just, pure, lovely, and of good report. Those things that are praiseworthy and honorable we think on those things. We need to set our mind on things above, where we are seated in the Spirit. And we can only do these things by following Christ and believing in His death, burial, resurrection, and ascension and having His precious blood cleansing us from all paralysis. I come before Your throne bodly, seeking mercy and grace. Break me free from any and all paralysis in my paradigms so that I may shift into Truth. Help me to set my mind on things above and to walked in the mind and paradigm of Christ. Help me to break down all strongholds that You did not erect and help me to build up Godly, Spirit-led paradigms with the foundation of Your Truth and blood and sacrifice for me. Give me more and more “Aha!” moments and revelation into Your heart and thoughts and paradigm of me. Wash me with Your blood. Fill me to overflowing with Your Breath. Breath in, on, and through me. Transfigure me into Your image and according to Your likeness. Free me from all religion and religious spirits and religious paradigms. Set me free so I may run into the Arms of Liberty. In the name above all other names, Jesus of Nazareth. My idea of God is not a divine idea. It has to be shattered time after time. He shatters it Himself. Love this prayer, I have found a-ha moments in some strange strongholds. What a coincidence, I was studying strongholds last week. Thanks for this prayer.